Be the CEO of YOURSELF with this app. Quantify your under-utilized time and assets for cash money. Uber was founded in 2009 and its workforce continues to grow exponentially: 400, 000 drivers are considered “active” on the Uber platform in the U.S. today and 1.1 million drivers are active on the platform globally. The company manages a large, disaggregated workforce of “driver-partners” that deliver a relatively standardized experience to passengers while simultaneously promoting drivers as independent entrepreneurs whose work is characterized by freedom, flexibility, and independence. Are Uber Drivers Employees or Independent Conspirators? The tension between standardized entrepreneurship and true independence have manifested in two countervailing lawsuits: the first, a pending class-action lawsuit by Uber drivers in California, O’Connor v. Uber Technologies, alleges that drivers are misclassified as independent contractors. In that lawsuit, Uber argues that its business model is premised on licensing software that acts as an intermediary between passengers and drivers: “The fact that we benefit from these individuals [drivers] using our apps simply makes them a customer.” (I wonder if they can be considered both *customers* of the app, like passengers, and workers). By contrast, Uber leverages so much control, albeit indirectly, over drivers that they may plausibly be better classified as employees than as independent contractors. The second lawsuit, Meyer v. Kalanick, is led by an Uber passenger in an anti-trust case alleging that Uber founder Travis Kalanick conspires with drivers to produce algorithmic price-fixing by arranging with independent contractor-drivers to charge a fare set by Uber or Uber’s surge-pricing algorithm. As independent entrepreneurs, drivers should be competing, even though it benefits passengers to have a reliable experience interacting with the system. Instead, Uber monopolizes the market and sets the rates for everyone. Uber has the full power to unilaterally set and change the rates passengers pay, the rates that drivers are paid, and the commission Uber takes. For instance, Uber driver protests erupted over pay cuts in New York and elsewhere when Uber slashed rates after New Year’s. While Uber’s contract (section 4.1) with its “partners” outlines that the fare Uber sets is a “recommended” amount, there is no way for drivers to actually negotiate the fare within the Uber driver app. Moreover, the contract explains that drivers have the right to charge less, but not more, than the pre-arranged fare. (Occasionally, drivers strategically end the trip early to get a higher rating from passengers.) Even if the misclassification lawsuit resolves by confirming the independent contractor status of Uber drivers, their current employment relationship with Uber potentially encourages them to subscribe to a system of price-fixing by a singular, dominant stakeholder — the company. This poor guy is sitting in surge without getting a ride. Can we get an algorithmic fix? 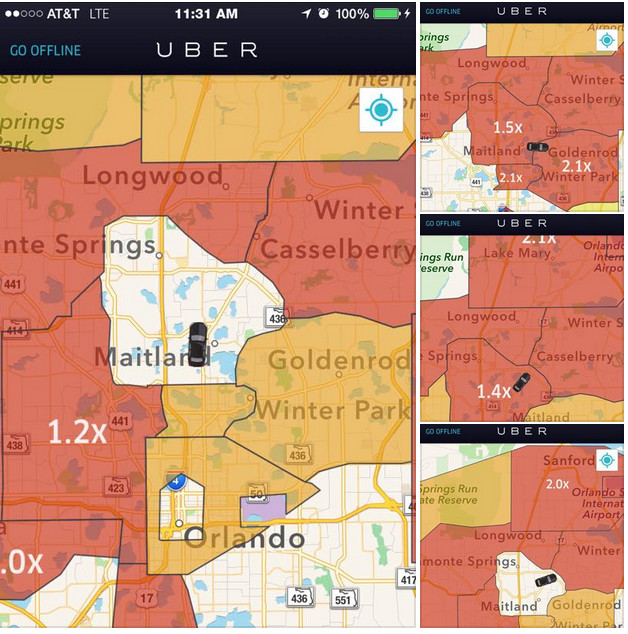 Uber uses its surge pricing algorithm to generate clusters of labor where and when passenger demand is high. I’ve covered this in more detail here, but the gist of it is that passengers pay more when surge pricing is in effect, and drivers are enticed to go online, or to relocate to where passenger demand is high in the hopes of receiving surge fares. The surge pricing algorithm relies on data generated by passengers and drivers, such as their location, to determine when demand (passengers) outstrips supply (drivers). 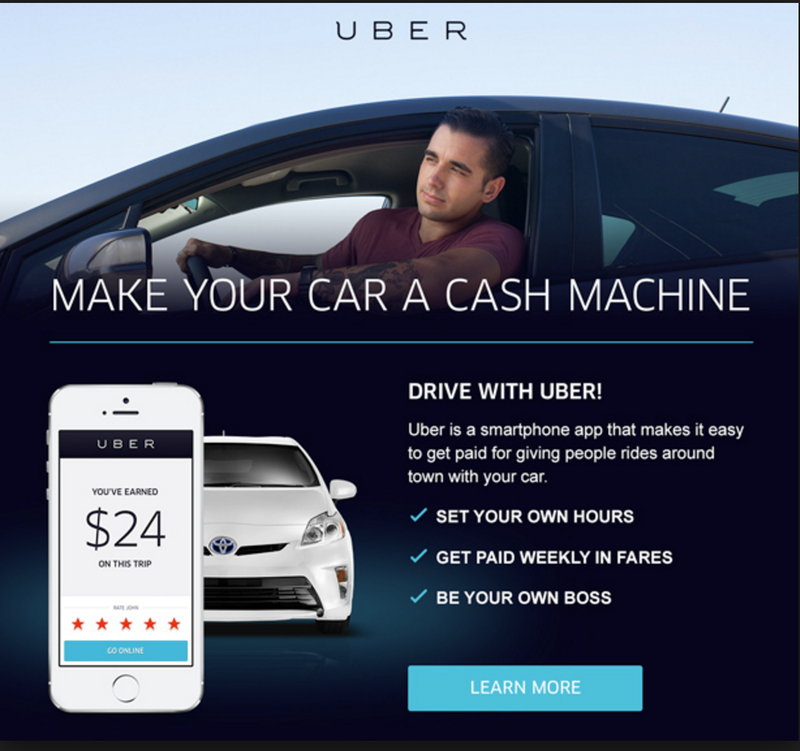 In this way, Uber leverages user data to produce targeted, algorithmic pricing across the markets where it operates. Are the conditions of driving for Uber necessarily a form of “collusion”? The anti-trust case is a fascinating plot twist for Uber drivers’ status as independent contractors, and for platform entrepreneurship. It seems Uber is damned if drivers are independent, and damned if they’re not.